The Maple Leaf quilt block is one of my favourite blocks to use when teaching a class for beginner quilters. This block introduces you to the nine patch format, as well as getting you started on making the most common quilt patch (second only to the square) used in quilts -- the half square triangle. 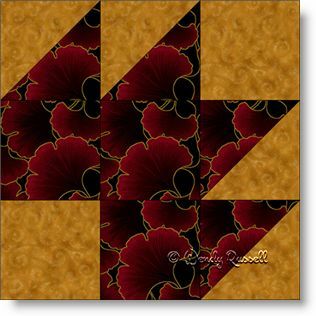 The construction is easy and you can do many things with the resultant quilt block, especially if you rotate the block to produce different effects in the quilts. Look at the illustrated sample quilts for ideas.